Have you ever fantasized about having that shiny and bouncy hair that shampoo and conditioner models have? Sure you did! That’s exactly the reason why we purchase hair product after hair product—only to find out that the effects on our hair are different. What are we missing? The best hair straightener, obviously! If you have a hair straightener, you can go all straight and shiny one day and curly the next. Nowadays, hair straighteners come in different variations, allowing you to style your hair accordingly with just one tool. But what is so special about this tool that women—and men—go crazy about it? Compared to other hair styling tools, hair straighteners have the capacity to make our hair look shiny. This effect is brought about by the direct application of heat onto the hair, partnered with the right material used that the straightener is made of. Yes, the material is usually the key to finding out if you have a good-quality hair straightener. Then again, the market is flooded with hundreds—if not thousands—of makes and models to choose from. You don’t have to worry, though, we’ve got you covered. In here, we are going to take a close look at three hair straighteners to determine which one best suits your needs. We will list down all of their features, provide you with the pros and cons of using each, and give you recommendations on which of the three is the best choice. Are you ready to bid farewell to your bad hair days? Read on! Just like what we just said earlier, the material matters when it comes to judging if a hair straightener is of good quality or not. For this one, you will get a mix of ceramic and tourmaline crystal ion plate. It claims to straighten even the coarsest and frizziest of hairs while also being capable of making curls and other style flips. Additionally, it is also equipped with microsensors, which regulate the temperature so your hair will not get damaged from too much heat. This technology also distributes the heat on the hair evenly. It has an adjustable heat setting that ranges from 140 to 450 Fahrenheit. Wherever you are in the world, you don’t have to worry about not being able to plug in this product too. It is compatible with both 110V and 220V outlets. 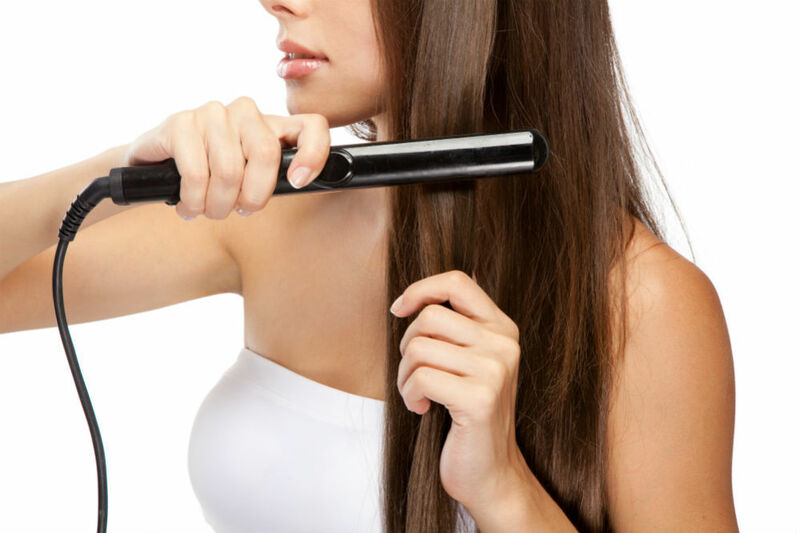 For your curling needs, this straightener is designed with a cord that can swivel at 360 degrees. Lastly, it comes ready-to-use too! The package includes an easy-to-understand guide, an argan oil hair treatment, a glove, and a storage pouch. Next on our list is a straightener that is made of a different material. The Kipozi Professional Flat Iron boasts a ceramic heater, but most of its other parts are made of titanium. This combination is believed to be the best when it comes to achieving ultra shiny and smooth hair. The heat can be adjusted from 170 to 450 Fahrenheit, which is shown on the LCD screen. This means that regardless if you have straight or curly hair, this straightener can make your dream hair goals come true. This is due to its far infrared technology, which is the one responsible for giving your straightened hair a shiny finish. For the busy professionals out there, you can ditch the messy bun too. This hair straightener heats up in as short as 30 seconds, so you can go straight to styling your hair. It also features an automatic shut-off option, which turns the straightener off after not being in use for 90 minutes. This iron is compatible 100V to 240V outlets and is designed with an 8-feet cord that can also swivel at 360 degrees. Lastly, it comes with a velvet pouch for safe and easy storage. The last flat-iron that we are going to review markets itself as a one-step hair straightener. Why? This hair straightener boasts an innovative design—a directional switch that you only need to rotate to achieve your desired temperature. Like the Kipozi flat-iron, this one is made of tourmaline and ceramic too. The company claims that it can be used to straighten and style hair in a short amount of time compared to other more conventional hair straighteners. The plates on both ends look like they are floating and have curved ends, which allows for ease of movement when curling or flipping the hair. It also features a long cord, 360-degree swivel cord, and an auto shut-off option. Any outlet between 110V and 240V is also compatible with this straightener. Lastly, you can go straight to styling your hair as soon as you get this product. It comes with lots of freebies, including a fine-toothed comb, two hair clips, a glove, and a storage bag. This review is really a hard one because all the hair straighteners that we have mentioned can really straighten the hairs well. Having said that, there is still one the reigns supreme, and that is the Furiden Professional Hair Straightener. It wins not just because of its design, but also with the perfect finish that it leaves the hair. The best thing about it is the fact that you are sure that your hair is only remotely damaged if it gets damaged at all. One of its notable disadvantages, though, is its ability to not heat up to the maximum setting. This might be deliberate as the highest setting is not healthy for the hair. Another good thing to note about this is the fact that it is so easy to use, even if you are curling your way. Truly, this hair straightener is a versatile hair styling tool that anyone would want to have in their arsenal.